One of life's many challenges, is fitting everything you need into a suitcase or a little travel bag. Some people might not have difficulty with this, but if you're anything like me, then packing can be a dangerous thing. I always feel the need to bring EVERYTHING I own with me "just in case". I leave for NYC tomorrow and I refuse to be stupid with my packing. This time, I'm packing smart. 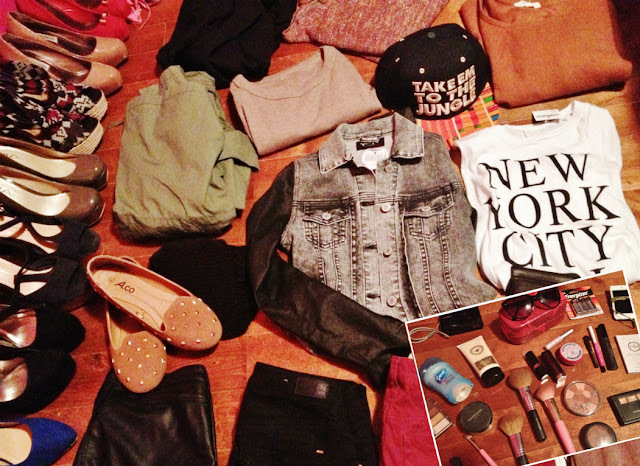 Now, I personally find that the key to packing smart, is to pack simple things that can be thrown together anyways. You have to be able to mix match what you're bringing so that you don't get stuck having to think of a 'set outfit' for each day. I also had to grab a few of my 'daily essentials' ... just the few pieces of makeup I might want to use .. some brushes .. deodorant ... sunglasses my camera and IPod .. nothing special. As far as shoes, I haven't gotten to that yet .. but my Lita's should suffice ... hopefully ! totally digging that leather sleeved jean jacket! and the new york city top is a must for nyc! Hey there! Thanks for the comment .. And yes, I loved the jacket the moment I saw it :) so excited to wear the jacket and the top for the first time on this trip ! Oh NYC! Packing is such a hassle, but it's so much fun. I bet NYC is loads of fun. Oh that sounds fun ! Why are you going to San Francisco? And yes, first impressions are extrememly important. Let me know how everything goes !